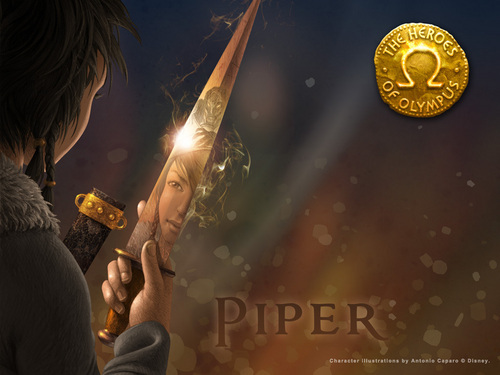 Piper (Official). The official picture of Piper as released door Disney Hyperion. HD Wallpaper and background images in the The Heroes of Olympus club tagged: the heroes of olympus the lost hero piper. This The Heroes of Olympus photo might contain concert. That must be her WoC (weapon of choice). Notice the armored guy behind her in the reflection. Who is he??? Any guesses? I think it kind of looks like Typhon. If you go to link and click on "Olympians, Gods and Monsters" he's the first one. But it does really look like typhon, you're right. No I don't think it's Typhon I mean it seems unlikely to have the same practically unbeatable foe twice throughout all the books plus it looks like he's wearing a helmet. No, it's not Annabeth's knife. This is a dagger, which means it is a little bigger, plus this dagger is named Katoptris. It shows the holder something other than a reflection, but the information didn't elaborate on exactly what was shown. It's not Gaea it's Typhon if you havn't read the comments above. I sorta doubt it... agreed with Apollo4life. i wish i could see her face more clearly i can only see like half because of the dagger.